Donna and the Bears: Pinky Panda - preview bear for upcoming show! Pinky Panda - preview bear for upcoming show! 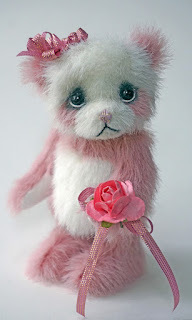 Here's my little sweetie, Pinky, for the upcoming Teddies Worldwide show. This show will include bears and friends and other artwork. You can click here: www.TeddiesWorldwide.com and have a look at the preview. When the show begins in a couple of weeks, you can use the same link to take you to the show! Enjoy!